This anime is so underrated I don't even know why. 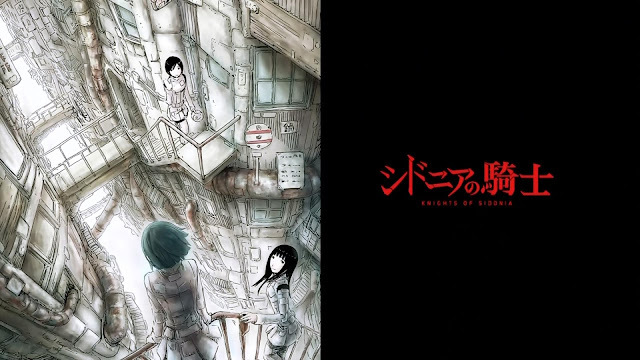 Well it's the second season of Sidonia and I'm just blown away at how Sidonia no Kishi: Daikyuu Wakusei Seneki bolted past my expectations in ways I didn't expect it to. I'm so happy that somebody suggested me to watch this otherwise I wouldn't have even bothered with this series. If you haven't seen the first season I'd suggest watching it otherwise this review would REALLY not make much sense; plus you'll be in for a nice surprise if you do decide to watch Sidonia. This review will be quite short since I don't tend to wrote long reviews for sequels. Anyways the story continues as it left off from the first season. The people of Sidonia are still attempting to keep the human race alive by protecting Sidonia from the Gauna, nothing too special but the wrench that's added to this season is that a new weapon Sidonia has created makes it's appearance this season. So basically Sidonia still comes in contact with Gauna and the Knights attempt to fight off the Gauna only this time they have a trick up their sleeve that gives Sidonia the upper hand to seal victory. Let's talk about the cast. Looking at the first season the cast of characters were very bland and no one really stood out as the "star" so to say. Going into the second season I still believe that there's no star of the show, however I really enjoyed the fact that the characters were a lot less bland compared to season one. There was more chemistry between main characters Izana and Tanikaze, including their relationship with guardian pilot Yuhata. I found myself actually laughing and smiling during the this season since there were so many more comical tactics used. Adding to the comedy the fights against the Gauna were more epic than last season, especially the battle during the last 3 episodes which had my eyeballs glued to the screen. This change in chemistry between the characters is all thanks to Tsumugi Shiraui, who happens to be Sidonia's new secret weapon. She's a chimera, meaning that she was artificially created using Hoshijiro's DNA and a Gauna specimen. She's relatively large in size, so she usually creates a tentacle that's human-size, and uses that to communicate with humans when she's in Sidonia so that it's easier to communicate/ get around with. So happy when they introduced this character this season since she's the one that really got me to marathon the second season. Her interactions with Tanikaze are so moe-like it's hilarious to watch, really think she's the driving force for the improvement in chemistry between all the focal characters. When I was going tumblr I found some hilarious memes of Tsumugi that had me legit lol; yes that's her tentacle in the gif, it's exactly what you think it looks like...and no this anime is not dirty. Don't get it twisted just because I'm using the word tentacle haha. In all my years of watching anime, I have never seen animation like the animation used in Sidonia. I remember watching the first season hating the crazy CGI but now during the second round of Sidonia I absolutely love it. It's beyond refreshing/rejuvenating to see animation so different than the custom 2D animation you see in almost 95% of anime every year. Beyond impressed by the animation of the last Gauna the Knights and Tsumugi fought against during the last 3 episodes. Quick mention about the music: OST was the same I think, the tracks were okay. But the OP and ED of Sidonia no Kishi: Daikyuu Wakusei Seneki were quite disappointing, not as good as the ones chosen for the first. And a special mentation, I was so happy to see that they used the OP of the first season as the ED for the final episode! So that's it for this review. Final thoughts: second season was so much better than the first and so refreshing. To be honest my anime watching kind of slowed down since I don't have many titles to choose from to watch since I feel like I've seen all the must-see anime so far. Thanks to Sidonia I feel reenergized and currently looking through the anime archives to watch a few hidden gems. Anyways if you made it this far into the review, leave a comment down below on your thoughts about the second season or my review. Thanks again.